The Eco•Systems™ mission is to spread the principles of sustainability throughout the trade show display industry and offer the very best in environmental exhibit technology and services to the marketplace. This mission is a journey of constant environmental innovation to better serve clients, community and the environment. 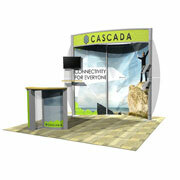 Eco•Systems™ is proud to be the Leader in Sustainable Exhibit Technology. From small portable displays, to large island displays, the sky is the limit. All Eco•Systems™ products are designed and constructed with the most environmentally friendly materials available. You can be assured that you cannot get a greener exhibit anywhere else. Inline trade show booths that utilise recycled/recyclable components, equal to or exceeding the quality of similar traditional exhibits. 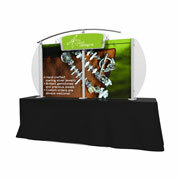 Specifically made for the table top, these displays use the greenest materials and present a highly professional look for your brand. 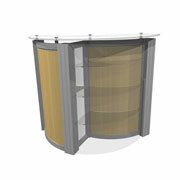 Furniture designed and built to complement trade show displays, made with the greenest materials available.